Debunking Bloomberg's 'alarming' climate graph: Are we really on track for 4°C global warming by 2100? | Watts Up With That? David Burton has already done a wonderful deconstruction of Bloomberg’s absurd global warming attribution graph, by Eric Roston and Blacki Migliozzi, contrived from data by the notoriously unreliable NASA GISS, purporting to demonstrate that 20th-century global warming was reely ’n’ truly all caused by our sins of emission, honest it was, guv’nor, cross me ’eart an’ ’ope to die. What that graph really helps to indicate – though its fanatical originators would be horrified if they realized it – is just how little global warming we are likely to see this century, even if no one cuts emissions at all from now on and CO2 concentration continues inexorably to climb. The usual suspects – such as the British Communist newspapers The Guardian and The Independent, for instance – have been telling us for the past few years that “scientists say” we are on track for 4 C° global warming this century. Well, we aren’t. Here’s why. Version A of the Bloomberg graph shows the alleged temperature effects of various individual manmade forcings; version B shows the temperature effects of all the individual manmade forcings combined; and version C, scarcely different from B, shows the combined effect of all manmade and natural forcings. David Burton has already pointed out numerous dodges deployed by GISS in the crafting of this characteristically misleading graph: the truncation of all but the temperature data after 2005 to conceal the rapidly growing and now irremediably serious divergence between prediction and reality, the GISS model’s estimates that in several of the past 100 years the greenhouse forcing actually fell; the model’s use of multiple pseudo-random number generators in the absence of sufficient climate observations; the bizarre choice of a faster greenhouse-gas influence half a century ago than today; the ex-post-facto guesstimates of both individual manmade and combined natural forcings; and the fiddled confidence intervals for greenhouse-gas influences on temperature that are as narrow for 140 years ago as they are for today. But that’s not all, as the same graph overlaid with the natural 20-to-30-year cooling and then warming phases of the Pacific Decadal Oscillation reveals. 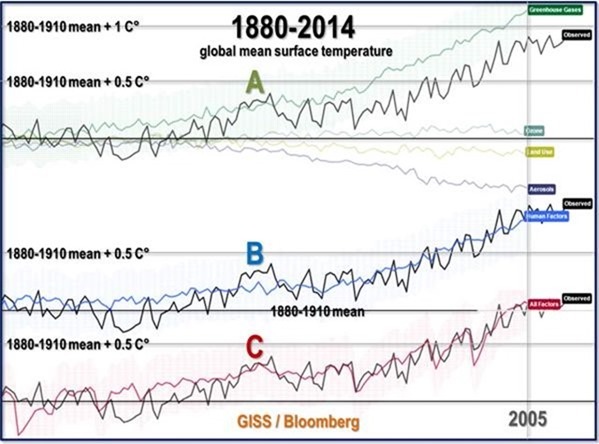 The biggest omission from the GISS/Bloomberg graph is synoptic natural variability. Indeed, the graph goes to some lengths to conceal it, not least by removing the decade-lines (here reinstated). GISS also chose a negative or cooling PDO phase as its 30-year baseline, rather than the near-60-year baseline 1890-1946, which includes a full cooling and then warming phase of the PDO (all PDO dates are from JISAO). The true baseline is a tenth of a degree above the artificially-chosen GISS baseline that makes the net 20th-century warming look quite a bit more severe than it was. Note how the cooling phases (starting with green year-lines) show little or no global warming. See also how there was 0.3 C° warming coincident with the PDO warming phase from 1925-1946, when hardly any anthropogenic influence had been felt. See how the 0.7 C° global warming from 1977-2000 coincided with a positive or warming phase of the PDO. See how little warming there has been since 2000, in the present negative or cooling phase of the PDO, even on the much-fiddled GISS temperature dataset, notwithstanding record increases both in CO2 emissions and CO2 concentration. In the first PDO-influenced warming period, our influence was not large enough to cause all of the observed warming. 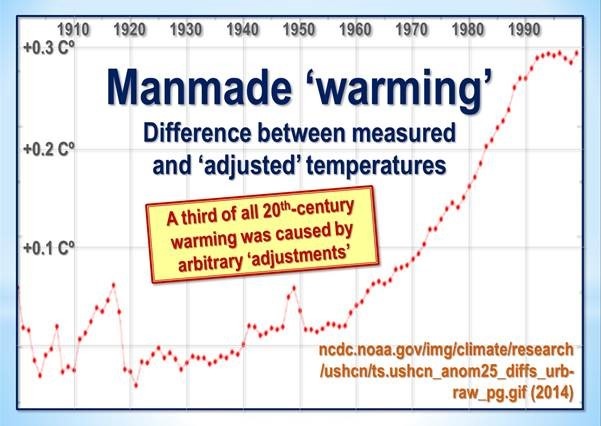 Let us assume we caused as much as 0.2 C° of the 0.3 C° warming shown. In the second PDO-influenced warming period, McKitrick & Michaels (2007) showed that warming over land had been overestimated by double, because the published data show a highly significant regional correlation with growth of population and urbanization that should not have been present if the urban heat-island effect had been properly allowed for. That alone leads to an overstatement of 0.1 C° in global temperature. Thus, out of the 0.9 C° 20th-century warming, 0.1 C° was natural; 0.1 C° was attributable to inadequate correction for urbanization; and at the very least 0.1 C° arose from over-enthusiastic tampering with the temperature record in a manner calculated artificially to steepen the apparent warming, leaving at the very most just 0.6 C° of anthropogenic warming over the 20th century. The current best estimate of the top-of-atmosphere radiative imbalance caused by this forcing but thus far unresolved by increases in atmospheric temperature is 0.6 W m–2, so that the 0.6 C° anthropogenic warming realized to date was driven by the remaining 1.7 W m–2 of radiative forcing, implying a final or post-feedback transient-climate-sensitivity parameter of 0.6/17 = 0.353 Kelvin per Watt per square meter. Now, the instantaneous or zero-feedback parameter is 0.313 K W–1 m2, and after 100 years the IPCC estimates that this will rise to 0.43 K W–1 m2, or about half, of the 0.86 K W–1 m2 that it expects to obtain at equilibrium. Given that almost three-quarters of the anthropogenic forcing has arisen in the 70 years since 1950, so that much of the centennial forcing has not yet occurred, the implicit value 0.353 K W–1 m2 that we have derived on the back of an envelope for the transient sensitivity parameter is indeed in the right ballpark, suggesting that 0.6 C° is a reasonable estimate of the anthropogenic warming of the 20th century. Armed with this information, we can proceed to work out whether we are going to see anything like the imagined 4 C° warming in the next 85 years. 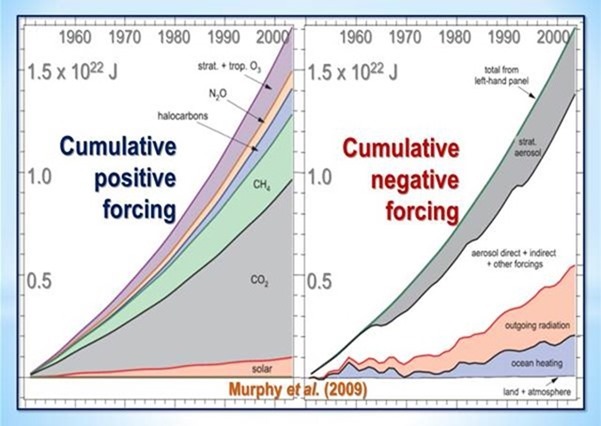 The CO2 forcing for the remainder of the 20th century is 5.35 times the logarithm of the proportionate change in concentration, which is now 0.04% of the atmosphere by volume and, on business as usual, is projected by the IPCC to rise to 0.07%. Thus, the CO2 forcing would be 5.35 ln 7/4, or 3.0 Watts per square meter. 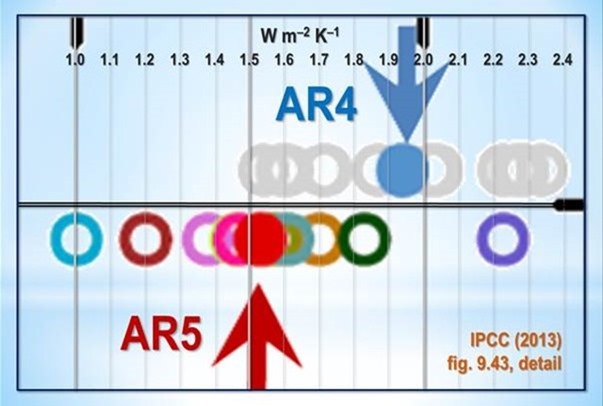 Since the IPCC’s current estimate is that CO2 accounts for five-sixths of all anthropogenic forcings, this should be increased by a fifth to 3.6 W m–2. That gives equilibrium warming of 1.8 C° as a result of 20th-century forcings. If the forcings were to occur at once rather than spread over the coming century, only half of this, or 0.9 C°, would occur within a century, and the rest within 1000-3000 years (Solomon et al., 2009). However, since the forcing will build up slowly over the century, perhaps with a slight increase in the top-of-atmosphere radiative imbalance as well, in practice only about a third of equilibrium warming is at all likely to appear by 2100. That is just 0.6 C°, of which precisely none has occurred in the first 15 years of the century. One might add a little to this to allow for some further warming caused by past emissions, or take quite a bit away to allow for the strongly canceling influence from manmade particulate aerosols, the tiny parasols that increase the opacity of the atmosphere and shelter us somewhat from the Sun. Murphy et al. (2009) go as far as to imagine that the negative aerosol forcing almost cancels out the CO2 forcing altogether. So far, every step of our calculation has been rooted in mainstream, established climate science, published data and peer-reviewed papers. Can one go still further? In one respect, no. As Roy Spencer pointed out with characteristic focus and concision in response to my previous posting, merely because the energy budget diagrams use the Stefan-Boltzmann equation at the Earth’s surface we must not assume that we can derive the Planck climate-sensitivity parameter from them. We must apply the equation at the characteristic-emission surface, which is the locus of all points at or above the Earth’s surface at which, under the assumption of a pre-existing radiative equilibrium, incoming and outgoing radiative fluxes are equal. We cannot take advantage of the far lower surface sensitivity parameter that obtains at the surface. What if we assume that temperature feedbacks are net-zero, an assumption powerfully suggested by 810,000 years of near-perfect thermostasis, with global temperature varying by little more than 3 C° either side of the long-run mean (a variance about the same as that of your home thermostat)? 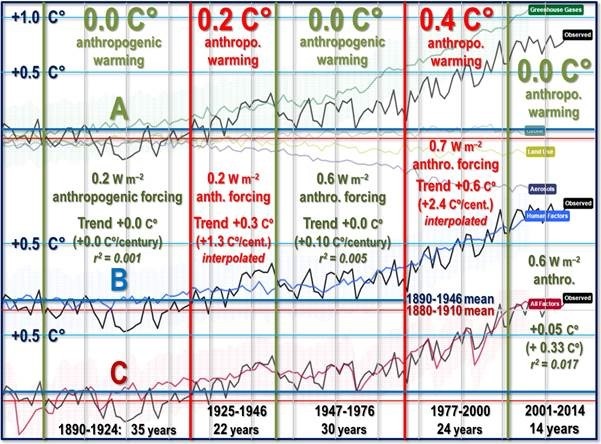 The “consensus” would have us believe that the temperature changes of the past 810,000 years, covering an interval of at most 6.5 C°, were driven by tiny forcings amplified by hefty feedbacks. It is no less likely, however, that the forcings from events such as supervolcano explosions and Milankovitch cycles were large and the feedbacks small – perhaps even net-negative. If the feedbacks were net-zero, the instantaneous and equilibrium warmings in response to the 3.6 W m–2 manmade forcings expected in the remainder of this century, assuming none of the strongly negative forcings from aerosols, land-use changes and ozone effect that the GISS/Bloomberg graph assumes, will simply be 0.313 x 3.6 Watts per square meter, or 1.1 C°, of which about half would arise over a century because the change in concentration is not instantaneous but is spread over the next 85 years. Result: about 0.5-0.6 C° of global warming, not much different in the medium term from the high-feedback case. Whichever way you stack it, it is difficult to make a serious case for even 1 C° of anthropogenic warming by 2100, even on business as usual. I shall probably not be around in 85 years’ time to find out. Yet perhaps the scholars of the future, peering at these postings at WattsUpWithThat, may one day marvel that, armed with nothing more than common sense, an ambition to find the truth rather than make a fast and dishonest buck, a pocket calculator and the simple model in Monckton of Brenchley (2015: just go to scibull.com, the website of the Science Bulletin of the Chinese Academy of Sciences, and click “Most Read Articles”, as more than 30,000 others have done), we were able to reach a far more reliable estimate of this century’s global warming than the billion-dollar brains of the profiteers of doom. 4 C° global warming by 2100? Fuggedaboudid. 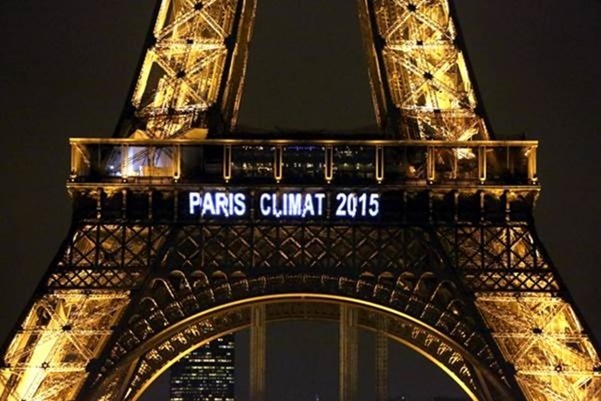 Will someone tell the sanctimonious global-government wannabes in Washington DC, London, Bonn, Rome, and – above all – Paris? You mean the Dead parrot talks – at which they try to explain how the parrot (i.e. global warming) is only resting. Just for the record, CO2 is 0.04% rather than 0.4%. To Answer: No. There have been no measurements of any kind that would indicate this trend.exists. There is no crisis. +4C would be great. The habitable area of the earth would double. We’d finally get that NW Passage we’ve yearned for. Eventually, it would delay the return of the ice sheets which are overdue. Dude! As you say, +4C would be a disaster. You are talking about the near total devastation of downhill skiing, at least in eastern North America. The benefits of the NW Passage and huge gains in international commerce pale in comparison to the catastrophe which would hit skiing. Now, I am all for expanding the tropics as much as possible, but there are limits. As a New Englander, I would like to see tropical water temps, coral sand beaches, and coconut palms as far north as the Gulf of Maine. But we would still need to find a way to insure good snow coverage in the adjacent mountain areas. I think we best consider this whole “climate change” thing to still be a “work in progress” and keep at it. Tony, there is no such thing as downhill skiing in Eastern North America. Well maybe if you bold the hill in downhill… You really need to come out west to see what alpine skiing truly is!
. . . and the lies are becoming really tiresome. Since Version C and B are almost identical, then we can surely say that, regardless of any analysis, there will be little effect on global warming from human activities. A strange graph for them to put out if they want us to worry about AGW! B and C being almost identical indicates natural forcings would be inconsequential. The Alarmist community is reknowned for their extremely well-washed hogs. Well, it is only Tuesday evening, but that was the best laugh of the week so far! OMG! It’s the repeated washing of hogs that’s the primary reason for global warming! Haven’t you read the ruling by the SCOTUS? ‘The CO2 forcing for the remainder of the 20th century is 5.35 times the logarithm of the proportionate change in concentration, which is now 0.4% of the atmosphere by volume …’. I think that should be 0.04%. Except ice core studies show the time periods 1788 to 2002 and 300 to 350 AD both show higher than current levels of soot over Greenland. resolution of less than a year. than before 1850) mark the last 50 years of the record. same as 1670 years ago. But does is low or raise the forcing? seasonal changes, the soot effects must be important. Don’t worry about alterations to terrestrial albedo: they’re insignificant compared with atmospheric albedo, chiefly from clouds, and still less significant because the atmosphere is already quite opaque, and still less significant because of the high-latitude solar azimuth angle. “Climate change is amongst the most high profile news stories of recent years and while we’re fully committed to balanced an impartial coverage of the issue, the overwhelming scientific opinion is that human activity is increasing the rate at which the earths temperature is rising. As a public service broadcaster we have an obligation to reflect this broad scientific agreement on climate change and we reflect this accordingly; however, we do aim to ensure that we also offer time to dissenting voices”. You are likely familiar with that. Just a string of lies really. Nor are they Socialist. I wish they were. The truth is that they are currently ‘Theocratic’. They believe they know the truth about virtue and the truth about damnation if we (carbon) sin. They are wrong, but recognise why. It’s not because they have adopted an intellectual methodology that leads towards conclusions you disagree with. They might still be right. It’s because they have adopted an intellectual framework that happens to exclude a probable reality. And that skews their estimates. Folly. MCourtney– The Guardian most assuredly has a pro-Socialist and anti-free-market/anti-limited government bias. To assert otherwise is simply a misinformed notion. But to state that both it and the Independent are “British Communist” (whatever that means) is a needless political judgement and a distraction I would suggest to many British and European readers, myself included, and detracts from the rational arguments of the remainder of the article. Attacking the purported science not your subjectively judged politics of your opponents is I would venture the best method to gain and maintain the sceptic point of view. Since when is Bloomberg a source for serious science? Not in my book. Chances are their science writers (if that is what they are) came close to flunking required science courses in college. The public is ill-served by junk articles and graphics such as the Bloomberg article. Since when are climate scientists a source for serious science ? I hope you are wearing a HAZMAT suit while handling GISS “data”. No it doesn’t. The figure presented to support this is from USHCN, for the continental US only, and is dominated by TOBS, a US issue. Even worse, its U.S. adjustments from USHCN version 1 in 1999, back when manual adjustments were used instead of the pairwise homogenization process. do you two ever both to look at the reality of the outcome of those stupid homogenizations? i mean just have a look at how YOUR manipulations are screwing the Australian high quality record, or New Zealand for that matter. they all claim worlds best practice and have alterations greater than that graph. anyone can do it, from start to end, how climate data according to ‘worlds best practice’ is not related to this world at all any more. the people who produce this crap and push it are just liars, it is simple as that. No they don’t. Any problem is hand waved away. They assure anyone who reads their contents that everything else is fine, except for all the problems pointed out to them. In a credible scientific field, obvious errors would send you back to the drawing board. Not global temperature adjustment. How many data points existed in 1900? How many exist now for 1900, and have been adjusted for TOBS? Perhaps Zeke can expand upon that pairwise homogenization process for that time. I think it fair to ask. Well, they sure remembered the negative PDO in the 50s – 70s, but somehow forgot to include the current one. Even Karl from NOAA would have a hard time arguing that point. Even with their hugely elevated warming during 2000 to 2014 from 0.066 to 0.116 C/decade, this only gives 0.116 C/decade x 8.5 decades = 0.99 C.
True, if they work at it long enough, they are likely to dream up more ways to massage it than a Japanese Nuru expert. should actually be 0.04% by volume, no? I prefer 1/25th part of ONE percent…for some reason that gets a better hit, when I lay it on Warmists. 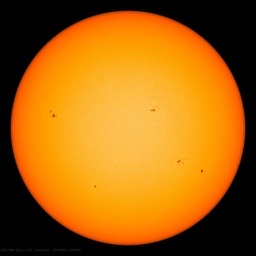 It’s hilariously sad watching the CAGW warmunists trying to blame the 19-year “hiatus” on weakening solar cycles, and even going so far as to say these weak solar cycles may be the precursor to Grand Solar Minimum, which may cause global temps to cool for the next 40~80 years…. What the warmunists leave out of this argument is that the strongest 63-year string of solar cycles in 11,400 years occurred from 1933~1996 (Solanki 2002), which could easily explain most, of the 20th century warming; not CO2. Every day, every week, every month, every year and every decade below a trend of 0.37C/decade, simply necessitates future warming trends to be that much steeper..
CO2 concentration in the atmosphere is 0.04 percent. Plenty of people independently checking HADCRU and GISS surface temp “data” are finding large problems. Careful observations of surface temps from stations with good metadata in rural locations show zero warming. Most surface station data are clearly corrupted by poor site maintenance. Any web search will reveal many peer reviewed reports of northern ice melting due to soot and dust on the surface. The so-called 3.7 watts per square meter of warming is for when CO2 reaches 560 ppm. This has not occurred. Currently there is no measurment that clearly shows any global change of OLR on a global basis. Actual OLR measurments show a trend line of zero slope. Why do people keep ignoring the obvious – the effect of clouds. Clouds cover 70% of the Earth and radiation effects are minimal below them because of the relatively small temperature difference. The calculation of Radiative forcing from changing concentrations of CO2 were “revised” To a constant 5.35 In(C/CO) by Meyer et. al. in 1998. Yet GCM’s use sensitivity figures that vary by 300%. No one has been able to describe a mechanism for CO2 heating the atmosphere, It’s all pseudo science. IMO. Addendum: Meyer used a computer model To derive his constant. I’ve read your explanations of the adjustments at Climate Etc, but why don’t you ever reply to the specific examples of adjustments that so many here and at Climate Etc. have cited as obviously (in their opinion) wrong. Either defend those specific adjustments and tell us why, or tell us how and why those specific adjustments were mistakenly made. Drive-by comments don’t increase understanding. Who exactly is this Lord Monk dude? Is he from a monastery or a zoo? I would have no hesitation laying an ‘odds-on’ bet that Earth is not on track for 4 C° global warming this century. I feel 100% confident. I base my confidence, not on science, but on all those numerous well-intentioned predictions made over the last 100 years, by so called scientific experts, and which have never come true. This tells me that scientists have an atrocious record trying to predict climatic events. And there is good reason why scientists are useless at predicting climatic events – it’s been identified in the IPCC reports i.e. Earth’s climate is an highly complex, chaotic and unpredictable system. Endless model and data adjustments, manipulations, alterations and amendments, not to mention highly selective omissions, simply gives the warmist game away to any rational person. Has there been a single piece of *observed temperature evidence* that can support a potential 4C of warming over the next 85 years? Anything at all? No, there has been none whatsoever. Instead we have statistical contortions that would cause Houdini nightmares, all to promote a theory of catastrophe that has become an absolute joke. Alarmist climate ‘science’ is complete and total BS. The warming is “in the pipeline”. Trouble is, the pipeline appears to be jammed at the moment. Roto Rooter to the rescue. the issue here that there has been an attempt to bring a ‘facts’ into a fight which in reality has nothing to do with facts. You cannot win by pointing out how these claims are not supported by the facts becasue the ‘value ‘ of these claims has nothing to do with facts. The truth wins in the end, provided there is someone willing – at whatever cost – to tell it. Thank you for your essay and keep up the good work. My lawnmower can accelerate to almost 10mph in about 5 seconds, if I were to allow it to continue to accelerate until the year 2100 it would reach a velocity of 2349415076.4mph. To round that for a worst case scenario if say its heat caused an additional acceleration or somehow its speed caused more speed to occur it would reach well over 3,000,000,000 by the year 2100. I must stop using my lawnmower because if I should fall unconscious it would surely kill me. Yes, not very funny but quite accurate to the argument put forth by the original argument. The Earth’s average temperature is regulated by gravity. There is no change in that gravity shown in the chart. gravity is just one of many variables. Mars and Venus are low compared to Earth, but at opposite extremes. Jupiter is high (at liquid surface) but cryogenically cold. Its good to be the Momma Bear porridge. It always cracks me up how these scientists can be so precise about how much warmer it will be in the year 2100. Meanwhile, they can’t get the short term stuff right. Here in my neck of the woods (northern New Hampshire, USA) our predicted high temperature for tomorrow has been reduced by 7F compared to yesterday’s forecast because low pressure to the south is wandering further north than anticipated and it will be cloudier than expected thus suppressing the maximum temperatures. So from 2 days out to 1 day out from the forecast, there was a 7F difference in predictions, but these scientists claim it will warm by ~9F in about 30855 days?